With the presence of a number of large-, medium-, and small-scale vendors, the global bioactive wound management market demonstrates a competitive and fragmented business landscape, finds a new research study by Transparency Market Research (TMR). The leading players in this market are taking up creative strategies and are introducing novel products constantly in order to ensure product differentiation to gain an edge over their competitors. Going forward, the shifting focus of these vendors towards expansion in various economies, together with the strong presence of local players in several countries, is projected to intensify the competition within this market in the years to come, reports the study. According to the research report, the opportunity offered in this market will reach US$1.1 bn by 2017 end. Progressing at a CAGR of 11.90% during the period from 2017 to 2022, the market is expected to rise to US$2.05 bn by the end of the period of the forecast. “On account of the significant rise in the global geriatric population and the subsequent prevalence of diabetes, leading to an increase in a number of wound-caused diseases, is the key factor that is propelling the worldwide market for bioactive wound management,” says a TMR analyst. The increasing prevalence of various chronic diseases, such as diabetes, cardiovascular and peripheral vascular disorder, and several other debilitating diseases, has resulted in an alarming surge in cases of chronic wounds, propelling the adoption of advanced wound care products and, consequently, stimulating this market. Apart from this, the augmenting awareness regarding healthcare among people across the world, upswing in the preference for tissue replacement therapy, and the rising demand for bioactive material are also driving the growth of this market, noticeably. On the other hand, the high cost incurred in the deployment of bioactive wound management solutions are projected to limit their adoption in the near future, hampering the market. However, the increasing demand of technologically advanced and highly effective wound care products among medical professionals is expected to create the need for efficient management, reflecting greatly on this market over the next few years. The research report also presents a comprehensive study of the global market for bioactive wound management market. As per the study, North America, Asia Pacific excluding Japan (APEJ), Europe, the Middle East and Africa (MEA), Latin America, and Japan are the the main regional markets for bioactive wound management solutions and services across the world. Among these, North America is the current market leader. 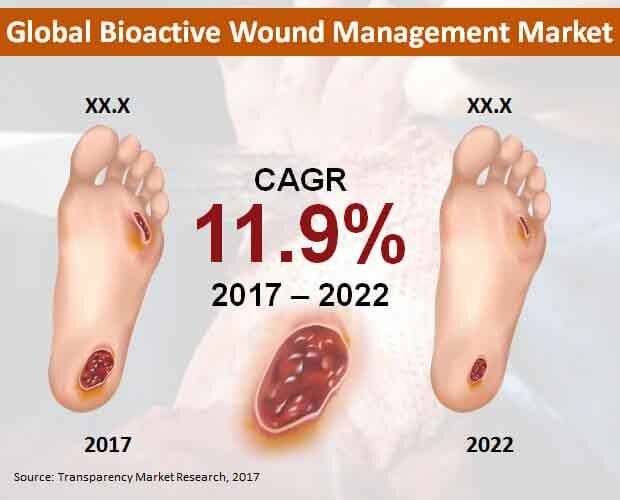 Rising at a CAGR of 12.80%, the North America market for bioactive wound management is likely to maintain its dominance on the global market over the period of the forecast. The presence of a highly advanced and sophisticated healthcare infrastructure is expected to propel this regional market in the near future, states the research report.